My friend and fellow journalist Matt Thompson talked about a site called wordle.net during a blogging seminar at The Poynter Institute this week. Wordle takes keywords from blogs and creates a cool, colorful word cloud that can help give bloggers a better understanding of the types of topics they typically write about. I created a word cloud using the keywords from my own blog to see which words would appear. 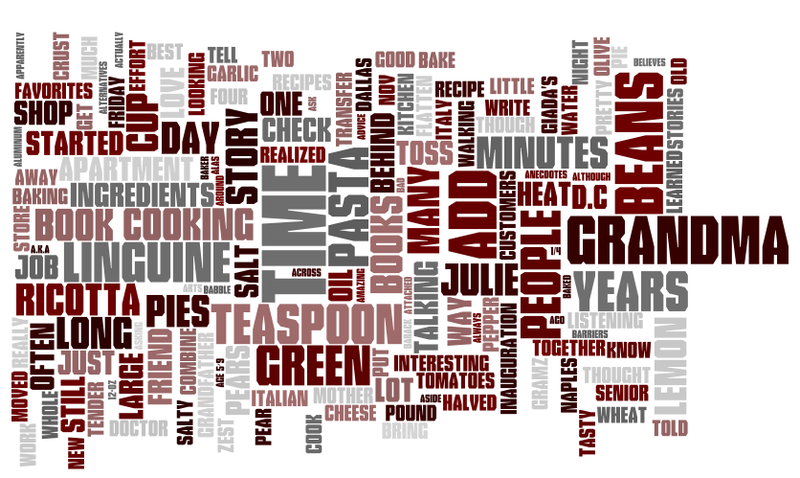 It seems that the word cloud pulled from the most recent posts on my blog, which revolve around people and food. I love that the words “Time” and “Grandma” are most dominant. What does your Wordle word cloud look like? Share a screengrab of it in the comments section of this post. Nice, lots of words about journalism and networking. Thanks for sharing!